This is no whale or shark. This is a piece of oceanographic equipment. With a torpedo-like body, this instrument glides effortlessly through the ocean, surfacing for a moment before diminishing into the depths of the sea collecting data in the name of science. 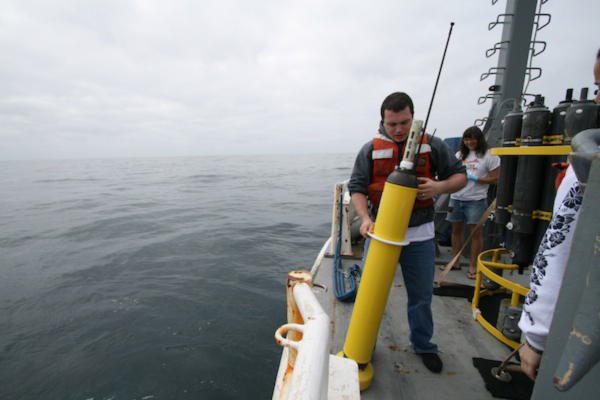 Each and every day, over 3000 scientific instruments called Argo floats are traveling through the ocean in a series of calculated ups and downs, just going with the flow – the flow of ocean currents, that is. The Argo network is an international collaboration that was born in 1999. It has been working tirelessly ever since to help determine the changing state of the upper ocean and patterns of ocean climate variability. Measuring temperature, salinity (the saltiness of the ocean), and currents, each float provides a unique piece of the ocean observation puzzle. An Argo float’s life often begins in a laboratory, like The National Oceanic and Atmospheric Administration’s Pacific Marine Environmental Laboratory (NOAA-PMEL) in Seattle, Washington. PMEL’s Argo Float Program has been deploying Argo floats since the birth of the network and currently has over 400 active floats in the water. Each float is cared for like a child, making sure it gets outfitted with the proper sensors and then it’s tested, tested, and tested again before being deployed into the ocean to begin its “adult” life. Locations of Argo floats in the water as of March 16, 2012. Includes all floats in international array, not just PMELs. Although each float leads a very solitary life of ups and downs, collectively the worldwide Argo network provides an accurate picture of changing ocean conditions in the upper 2000 meters of the ocean. Using a bladder, much like a swim bladder in fishes, an Argo float drifts down to about 1000 meters where it remains for 10 days taking measurements and floating with ocean currents. The float then drifts down deeper, as deep as 2000 meters, before sampling temperature and salinity as it rises to the surface where it relays its data to the rest of the world. Life cycle of an Argo float. The Argo Float Program at NOAA-PMEL, led by Dr. Johnson, is at the forefront of this research and they have over a decade of Argo float data to thank for it. The accumulating Argo data helps scientists, like Dr. Johnson, answer questions on a global ocean scale as well as provide detailed information on smaller scales such as the case with Indian Ocean waves and Antarctic waters. Can all the heat being absorbed by the Earth’s atmosphere and oceans be accounted for? The key to understanding how much extra heat Earth is absorbing due to anthropogenic (human-induced) fossil fuel emissions is important to determine how global change impacts the Earth system. A recently published Nature Geoscience paper describes how the oceans take up over 90% of this excess heat. Using Argo and satellite data together from 2001 to 2010, scientists conclude that the Earth has been accumulating heat continuously, mostly in the ocean. “Over the last decade, the net incoming energy measured at the top of the atmosphere is consistent with observed ocean warming within measurement uncertainties, implying that there is probably no ‘missing energy’ in the system as has been suggested,” describes co-author Dr. Greg Johnson, Oceanographer at PMEL. Without Argo float data, scientists would not be able to provide the accurate ocean heating baseline data for taking full advantage of precise satellite measurements. How can Argo floats teach us about deep Indian Ocean waves? It has been straightforward to see and measure waves and currents at the surface of the ocean. Now, what is happening deep below the ocean surface is being understood thanks to Argo floats. 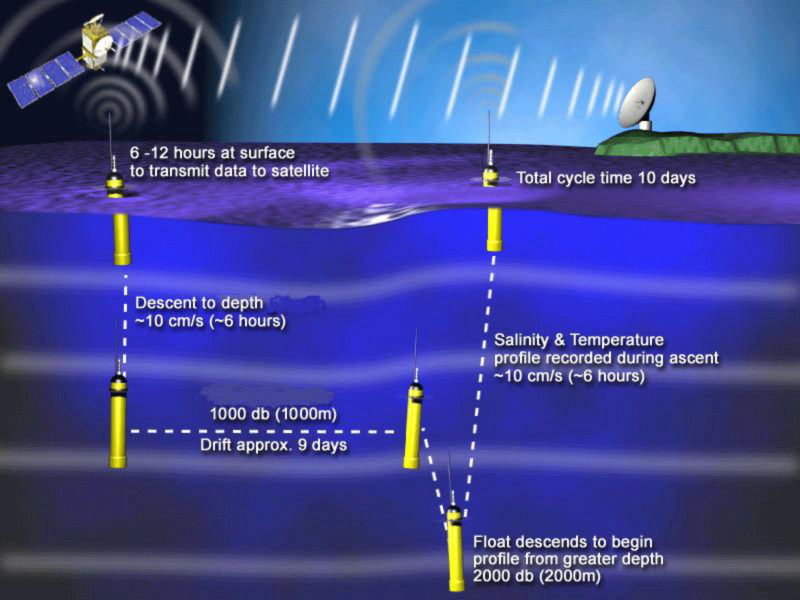 Most Argo floats are programmed to stop at 1000 meters and move with the ocean currents to explore. Dr. Johnson used this data to better understand deep signatures of southern tropical Indian Ocean waves, called Rossby Waves, in a 2011 Journal of Physical Oceanography paper. Rossby waves are most prominent in the thermocline, the boundary between the warm upper layer and cold deeper part of the ocean and have major effects on large-scale ocean circulation, and thus on weather and climate. Johnson helped reveal the deep reach of this wave and its speed across the Indian Ocean with the help of Argo data. Is significant warming occurring in Antarctic waters? Antarctic Intermediate Water (AAIW) is a dominant Southern Hemisphere water mass that spreads into all three oceans. Heating of this mass, found between 600 and 1000 meters, may reduce the ocean’s oxygen content in deep subtropical and tropical regions. Using Argo data, scientists concluded in a 2011 Journal of Climate paper that the AAIW core is significantly warmer than that recorded by the more sparsely sampled historical shipboard measurements. Measuring and analyzing these changes in specific water masses will give us a better understanding of how heat is transported below the surface of the ocean, and what effects these changes may have on future ocean heat content. Argo floats allowed a much-improved assessment of these changes. An Argo float before deployment off a vessel in the open ocean. Each float weighs about 50 lbs and are as tall as a person. Unfortunately, each Argo float’s life must come to an end. With a lifetime of around 5 years, each float has an un-ceremonial burial in the very waters where it helped gather important data during its life. PMEL and others are continuously replenishing the worldwide array and are deploying an average of 800 floats per year. So what’s in store for Argo floats in the future? Dr. Johnson and his colleagues at PMEL continue to deploy Argo floats, while taking advantage of new technologies that allow for longer life expectancies with less surface time allowing more dives per float. Scientists are also hoping to use floats and other autonomous instruments to reach below 2000 meters and under ice flows where current Argo floats don’t explore. “Each Argo float will provide its own lasting legacy with a unique data set that can provide us more data per day that we used to get in an entire year,” said Dr. Johnson. Johnson, G. C. 2011. Deep signatures of southern tropical Indian Ocean annual Rossby waves. Journal of Physical Oceanography, 41, 1958-1964, doi:10.1175/JPO-D-11-029.1. Loeb, N.G., J.M. Lyman, G.C. Johnson, D.R. Doelling, T. Wong, R.P. Allan, B.J. Soden, and G.L. Stephens (in press): Observed changes in top-of-the-atmosphere radiation and upper-ocean heating consistent within uncertainty. Nature Geosci., doi: 10.1038/NGEO1375. Schmidtko, S., and G. C. Johnson. 2012. Multi-decadal warming and shoaling of Antarctic Intermediate Water. Journal of Climate, 25, 207-221, doi:10.1175/JCLI-D-11-00021.1.